Wireless Weather Station measuring rainfall, temperature, wind speed & direction, barometric pressure. Vantage Pro2 weather stations include a display console and the innovative integrated sensor suite, which combines rain collector, temperature and humidity sensors, and anemometer all into one package making setup easier than ever and improving performance and reliability. Use with WeatherLink to download data to a computer. The wireless stations were the first and only stations in their price range to use frequency hopping spread spectrum radio. The wireless Vantage Pro2s transmit and receive data up to 300 m line of sight. 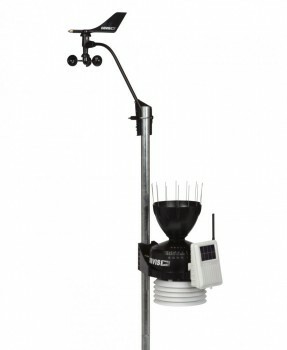 Weather Station Features Anemometer includes both wind speed and wind direction sensors. Rugged components stand up to hurricane-force winds, yet are sensitive to the lightest breeze. Wind-tunnel tested to speeds in excess of 170 miles per hour (274 km/h). The aluminum-plated tipping bucket in the rain collector is selfemptying, corrosion resistant, and laser calibrated for exceptional accuracy. Unlike the smaller rain collectors sold elsewhere, our rain collector meets the guidelines of the World meteorological organization. Reads rainfall amounts in 0.01" or 0.2 mm increments. Temperature and humidity sensors are located inside the radiation shield. The shield protects the sensors from solar radiation and other sources of radiated and reflected heat. Weather-resistant shelter houses electronic components for added protection against the elements. Wireless stations use frequency hopping spread spectrum radio to connect back to the console. Console Features Graph last 24 hours, days, or months of readings or highs and lows. View over 80 graphs including additional analysis of temperature, rain, rain rate, wind, and barometric pressure. All without a computer! Set over 70 alarms for multiple functions simultaneously. Compass rose with 16 compass points shows current and dominant wind direction. View current data or highs and lows for up to 24 different days, months, or years. Five-position trend arrow shows whether barometric pressure is rising, falling, or stable. Fixed display area shows the most important weather variables at all times. Variable display area lets you pick between: Inside or additional temperatures or soil moisture; Inside or additional humidity, UV index, or leaf wetness; Wind chill, dew point, or two different heat indices View daily rain or rain for this storm. Umbrella icon appears when it is currently raining. View monthly or yearly rainfall, rain rate, evapotranspiration, or intensity of solar radiation.